The hand carved Turkish Meerschaum pipe has a rich history dating back to the 1600’s. Block Meerschaum has been the premium choice for material in the world’s most prestigious pipes. It is such a popular choice because it is incombustible, lightweight, and extremely porous. This material helps to give the tobacco the finest taste, all the while offering the user a dry and cool smoke. The purest form of the Turkish block meerschaum is found deep underground in deposits near central Turkey. The meerschaum in raw form must be passed through a large number of hands before it will eventually become one of the finest smoking pipes in the world. The raw block meerschaum must be excavated from the ground by experienced miners. The material is scattered in various clay deposits of different quality and size. Hydrous magnesium sepiolite or silicate, also known as meerschaum, can be located in the soil at depths of 50 feet all the way to 450 feet. Modern equipment can extract the raw meerschaum from even deeper depths than previously imaginable. The mining of the meerschaum is an extremely laborious process, providing local farmers turned miners a needed income during the winter months. As earthquakes increase in Turkey and miners decrease, there is a growing concern for a reliable source of the precious block meerschaum. The block meerschaum has a hard layer of outer crust of the clay that also contains embedded stones. These deposits must be chopped away so that the white interior is exposed. This trimming and grading process can reduce the size of the block by over 50%. Once the blocks are trimmed, they are stored in plastic bags that will help to maintain the moisture within. Then the grading process is completed based on the density, color, size, and homogeneity. The majority of pipe carvers prefer to purchase the Turkish block meerschaum right from the source, the mine operators. The competition for this limited number of resources allows the operators to sell the blocks at premium prices. The most experienced of carvers will try to make use of as much of the block meerschaum as possible. The carving process is done with a saw and cleaver, allowing the carver to cut through the rough exterior and create the rough shape of the pipe. The shape of this block helps determine the bowl size and stem angle of the pipe. The most experienced pipe carvers will easily determine the ultimate theme based on block size. Like any sculptor, the master carver utilizes a unique carving style that will eventually be incorporated in the fine details. The pipe bowl must be kept moist so the cuts are clean. The meerschaum needs to be dipped in water to help restore surface moisture. The meerschaum tends to stick to the tools, so periodic cleaning and alternating of tools is necessary. Once the tobacco hole has been hand-drilled, the pipe bowl is allowed to dry out for hours in an oven so any excess moisture is removed. Then the draw hole and the mortise will be tapped. Now the appropriate stem is fitted to the shank and the entire pipe bowl is then sanded completely by hand. To achieve a velvety smooth finish, various sanding materials are used to avoid destroying any of the carver’s fine details. The stem needs to be removed so the meerschaum can be dipped in hot beeswax. This will harden and protect the material, while allowing the coloring process to be enhanced. Once the bowl cools and wax is stripped off, it is buffed to a fine finish. The stem is polished and reattached. Once the process is complete, a custom fitted case will help to add the final touch to the meerschaum pipe. The core of each case is wood, skillfully shaped so that it fits the unique dimensions of the pipe perfectly. Each box interior is carved by hand, making this process one of the most laborious in the pipe industry. The exterior of the pipe case will be covered in a durable vinyl, where the interior will be lined with beautiful soft velvet. Fine smoking pipes require regular care and the meerschaum is definitely no exception. Here are some ways to take care of your pipe and help add to your overall smoking experience. These tips will help to extend the life of your pipe as well. 1. Always fill the pipe bowl to the top. Since the bowl is seasoned with tobacco, it will help to provide a truer taste in the blend. 2. Be sure to condition the beeswax finish. By holding the stem of the pipe while smoking the first 10 bowls it will help to allow the excess beeswax applied during the first application to be reabsorbed. After the 10th smoke, you can hold the pipe any way you prefer. 3. Avoid build-up. Bend a non-bristle pipe cleaner into two sections to clean out the inside of the bowl. If you determine that reaming is needed, always seek out the advice of a professional tobacconist. 4. The more you smoke, the deeper the degree of coloring. To achieve maximum results, smoke two bowls each day for two days in a row. If you can smoke at least five bowls a week, the coloring process will continue. 5. Always rotate the pipe. The threads located inside the mortise will weaken if they become too moist. 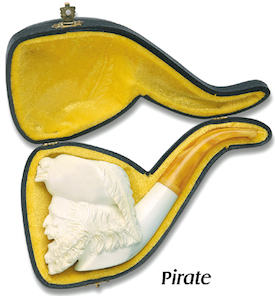 The meerschaum pipe should be allowed to air dry in an open case or rack in between smokes. Place a dry pipe cleaner into the stem overnight to absorb excess moisture. 6. To remove and then reattach the stem, always turn clockwise. Authentic meerschaum pipes use two-piece fittings in the stem. To remove this stem, simply grab the shank and bowl with one hand, grab the stem with the other hand, rotating clockwise as you slowly pull. When you need to reattach the stem, simply reverse the process. 7. Be sure that you use plenty of pipe cleaners. Non-bristle type will keep the meerschaum sweet. The regular style pipe cleaners are fine for occasionally removing build-up. 8. Periodically deep clean the pipe stem. Take care to remove the tenon from the pipe stem, and then clean out the residue collected above. Use heavy cloth to protect the tenon. Use pliers gently to hold the tenon and unscrew. Clean the inside with a clean pipe cleaner and then simply replace. 9. Removing the mortise requires extreme care. Keeping the mortise in place will avoid damage to the threads. Only remove the mortise if you notice visible cracks or damage. We invite you to stop by our Edmonton Tobacco shop to browse our large selection of premium Turkish Meerschaum Smoking Pipes or give us a call for special orders shipped direct to your home.